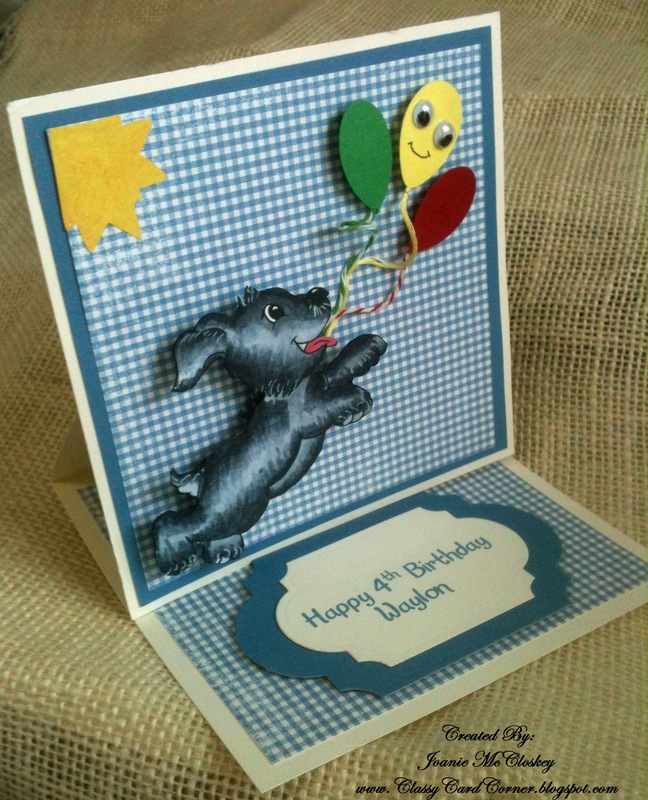 Joanie's Classy Card Corner: I Just Can't Keep a Secret!!! I Just Can't Keep a Secret!!! I was trying not to tell my secret until Sept.1st, but.... okay, so I have a big mouth. : )) Well, I am so delighted, excited, ecstatic and just so dang happy that I was asked to be a Design Team Member for SUNSHINE MAIL! 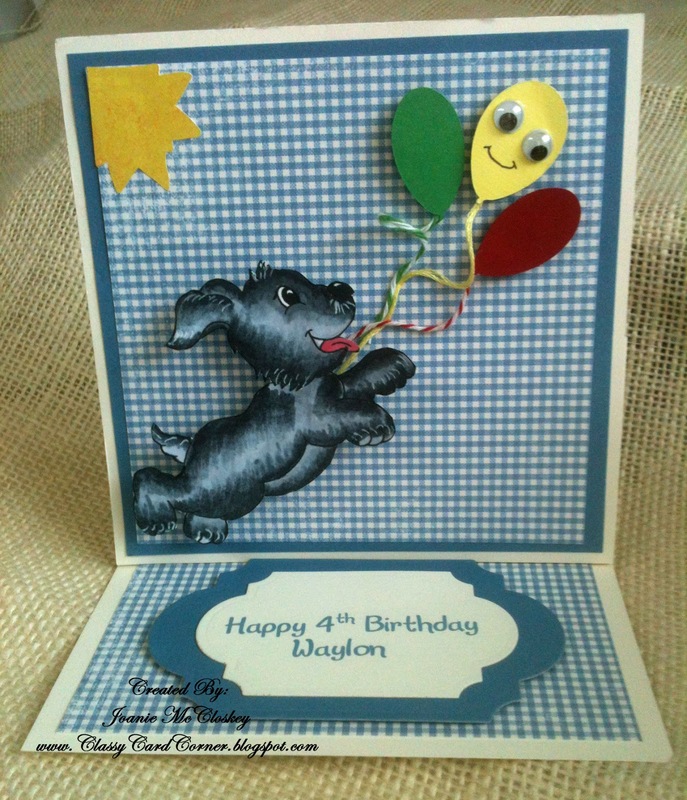 So September 1st was supposed to be my debut, but I received a Special Request for a little fellow, Waylon, who is turning 4 and needed to get my card sent in to be there in time for his birthday. Let's get started with the card and then more info about Sunshine Mail. I thought it would be a great idea to make an Easel Card so it could be in view for Waylon to enjoy. 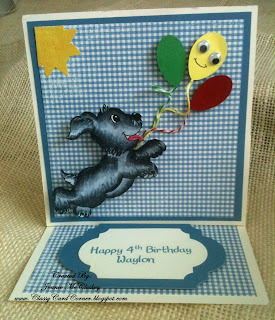 I think Waylon will get a big smile on his face when the puppy wiggles trying to catch the balloons!! Okay, back to Sunshine Mail which is awesome! Please go to the site and read all the great things that are being done for children in need of help due to illnesses. being in hospitals, foster care and homeless. 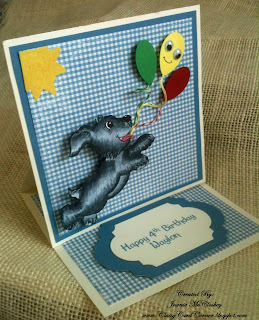 You can help in so many ways, but just sending a card makes them happy!!!. Gosh, lets get together here and help. I know I have cards that I have made that are sitting aside, wasn't made for any special reason, just waiting to be sent to someone. Well, scrappers get those out and send them to Sunshine Mail. There is also a Sunshine Blog with a challenge going on and you can win a prize. That's great too!! Please read the material (click on the blue underlined words) make a card, be sure to send it with the donate form, and put a smile on a child's face. There is only a few things you cannot do such as use glitter, sparkles, etc.. Thanks, in advance, for checking into everything I mentioned and I will be looking forward to hearing from my friends and all the scrappers in blogland.